Our forums have been quite vocal when it comes to Samantha Barry’s vision for Glamour, repeatedly calling out the questionable art direction since day one. We can’t fault her choice in cover subjects, however, as Barry often selects women not typically featured on other mainstream fashion glossies, including Melissa McCarthy and Tiffany Haddish. 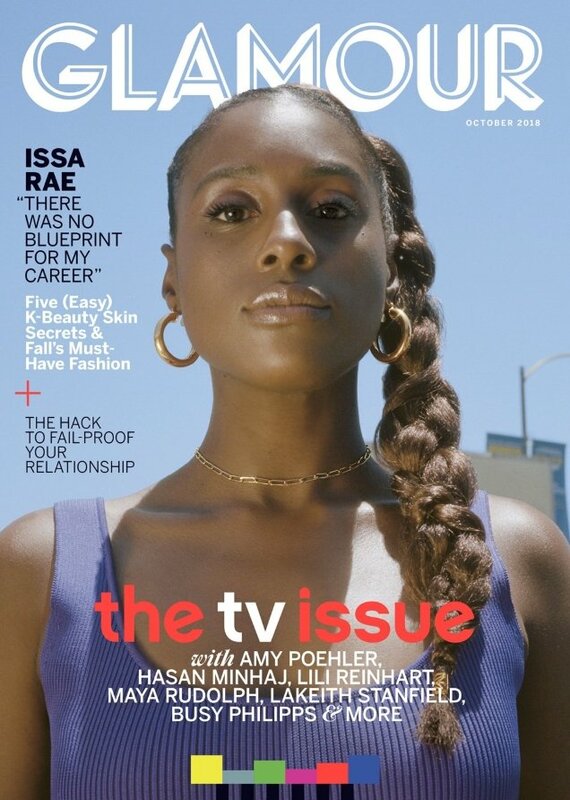 This month’s cover girl is also a breath of fresh air: actress and web series creator Issa Rae, who was photographed by Petra Collins and styled by Stella Greenspan for The TV Issue. Dare we say our forum members are warming to the new Glamour? “If they had put the old masthead on this cover I would have been pleasantly surprised. A step in the right direction I guess,” said A.D.C upon checking out the cover. “I am in love with Issa Rae and Insecure and it turns out she can’t take a bad photo even if they tried. There is a selfie quality to the image that’s somehow fitting for a magazine cover in 2018,” dodencebt pointed out. “I quite like it! The colored bars at the bottom were unnecessary though. A bit too literal,” said mikel. But not everyone was into it. “They could’ve done her way more justice than this! She’s really beautiful, and I find that her hollow orbits often makes her profile look all the more stunning. But the angle, necklace, styling and background makes this look way too pedestrian. Not a fan at all,” Benn98 voiced. “Looks like a bad fan-made cover to me,” said Piet Retief. Are you impressed? See Issa’s accompanying cover story and share your thoughts with us here.